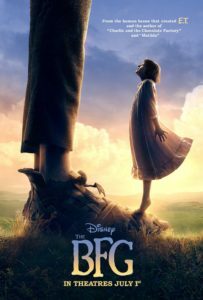 RYAN: Disney, Roald Dahl & Steven Spielberg come together for quite the imaginative cinematic event! It’s one of the most whimsical adventures I’ve ever seen. I didn’t read the book, so coming at this completely unaware of what to expect, it’s this amazing childhood fantasy that had much depth and weight to it. It’s so sincere and compassionate between the giant and the girl. And Oscar winner Mark Rylance (Bridge of Spies) is so brillz as the voice of the BFG. They must have employed motion capture – so expressive. CHUCK: I read the book when it came out in the early ’80s. And there’s a cartoon of it which I’ve never seen. And this is not like the typical American movie. First of all, the author and cast are British but also in it’s sensibility and tone. RYAN: It takes place in England. CHUCK: They tend to not treat children like they can’t handle intense subjects. It pushes a little bit more. Yes Mark is brilliant but the little girl that plays Sophie carries the film. RYAN: She did not have a false moment. CHUCK: Spielberg, once again, casts the right child. BECKY: She’s never too much, over the top or annoying. She’s very talented and strong. She’s a real kid. CHUCK: It all fits. And the blending between the reality of the setting and the CGI and skewing just left of perfect – it’s detailed but styled that puts us in a fanciful land. RYAN: The production design was all gorgeous – reminded me of Harry Potter or Alice in Wonderland. There is a real storybook quality to it that takes you away. BECKY: Very Peter Pan – that realm of like you’re seeing a play or something. The moment you see the cobblestone, you just enter another world. CHUCK: And the 3D was so great. It was like a pop up book. There are layers of depth and detail. So much attention to detail. BECKY: And no expression was missed. And the giant’s character is all in his eyes and now I was a BFG so bad. RYAN: I want a BFG. It thematically plays into what dreams mean and how they dip into reality and there’s a great affection for storytelling here. The color, the wonderment and magic all comes into play so nicely. It’s the personification of dreams like little fairies. CHUCK: It takes place in Roald Dahl’s reality. It’s our world but just a little left of reality. It’s a beautiful imagination. BECKY: The embracing of dreams and mixing yourself into it and how powerful they are. It’s really special. There was one line, in particular, that really stayed with me – but no spoilers. But our dreams are a part of us. RYAN: My favorite part of the film I can’t even giveaway but it’s, like, a whole standalone chapter in the film that is so fanciful and fun. CHUCK: It’s almost two different movies – the building of their friendship and then the adventure they go on. BECKY: And what they learn from each other. RYAN: And the evil in the film is very real but not like the typical evil villain in classic stories. CHUCK: And it’s not scary, it’s more comical. RYAN: It may not appeal to the very young. It’s a more dramatic film and even the action and adventure is almost quiet and calm at times and it’s all part of the story – it’s wonderful. CHUCK: What I appreciate about movies like this is that it requires the audience to be on the story’s time; not on my time, but on the story’s time. So much of entertainment, especially for kids, is so in your face and fast. This movie has a life of it’s own. RYAN: It has a pulse. BECKY: There’s something special and rare about that, you’re right. RYAN: It started with MTV and music videos – attention spans are so much shorter today but you’re right, this is more deliberate. CHUCK: And the timing is more British too. BECKY: It’s so great to just sit back and watch them watch each other and work together and let the story unfold. CHUCK: And the reward for it is so great. RYAN: And the climax is 100% Steven Spielberg – it’s his forte. CHUCK: And the beginning too – he lets his movies breathe. BECKY: I was either smiling or teary eyed the whole time – it’s so nice. RYAN: It’s probably, and I don’t mean this in a cheesy way, it’s one of the sweetest movies ever. CHUCK: It’s not saccharin. It’s sweet and heartfelt. RYAN: It’s a lot of fun.